Vedantu.com - No.1 online tutoring company in India provides you Free PDF download of NCERT Solutions for Class 6 Maths Chapter 3 - Playing with Numbers solved by Expert Teachers as per NCERT (CBSE) Book guidelines. 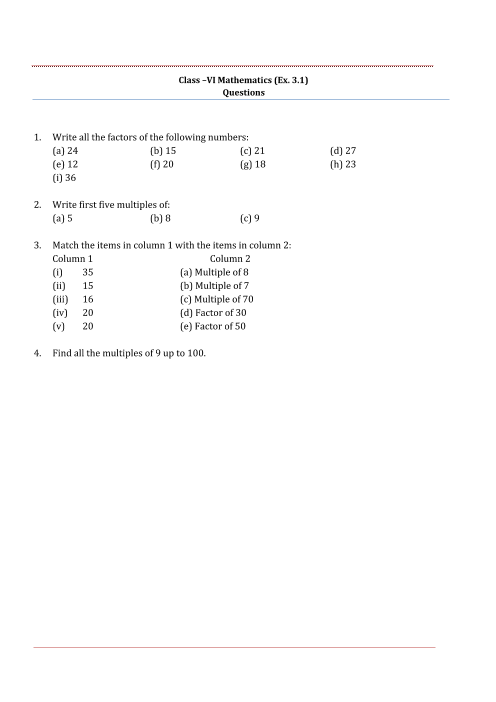 All Playing with Numbers Exercise Questions with Solutions to help you to revise complete Syllabus and Score More marks. Register for our free webinar class with best mathematics tutor in India. NCERT Grade 6 Mathematics Chapter 3, Playing with Numbers begins with Introduction to solved problem questions that introduce the concepts of divisors and factors. As you progress through the chapter, Factors and Multiples adds fun to the chapter in the form of a game that the students can play and simultaneously understand about factors and multiples. They will be able to solve problems associated to factors and multiples towards the end of the activity.Prime and Composite Numbers, a very important and fundamental topic of Mathematics is introduced in NCERT Grade 6 Mathematics Chapter 3, Playing with Numbers. Exercises for the topic given at the end of it help to develop a grip and understand Prime and Composite Numbers in-depth. As the chapter progresses, students will learn about, Tests for Divisibility of Numbers, Common Factors and Common Multiples, Some More Divisibility Rules, Prime Factorisation, Highest Common Factor, Lowest Common Multiple and Some Problems on HCF and LCM.NCERT Grade 6 Mathematics Chapter 3, Playing with Numbers will help the students to strengthen their foundation on Numbers to deal with further complex topics meritoriously. Get 100 percent accurate NCERT Solutions for Class 6 Maths Chapter 3 (Playing with Numbers) solved by expert Maths teachers. We provide step by step solutions for questions given in class 6 maths text-book as per CBSE Board guidelines from the latest NCERT book for class 6 maths. The topics and sub-topics in Chapter 3 Playing with Numbers are given below. Ex 3.10 - Some Problems on HCF and LCM. EXERCISE 3.7 - 11 Questions with Solutions. Other than given exercises, you should also practice all the solved examples given in the book to clear your concepts on Playing with Numbers. You can also download the free PDF of Chapter 3 Playing with Numbers and take the print out to keep it handy for your exam preparation.